Knight Frank LLP is headquartered in London, and together with the company’s New York based partner Newmark, operates from 207 offices in 43 countries. More than 6,340 professionals worldwide handle almost £594 billion worth of commercial, agricultural and residential real estate annually. To maintain its international network of operations, the company relies upon IT systems and communications. As the company has expanded across offices worldwide, there has been a requirement to share information. Knight Frank successfully implemented a virtual private network and a web content management system that all offices could access, as well as providing a single global property searching interface for clients. While improving the efficiencies of the global network, the new systems brought with them support challenges. The UK IT service desk wanted to find a way to manage calls for any customer worldwide, yet still enable overseas IT teams to manage local issues. The team prepared a business case for a fully ITIL compatible service management tool, which also offered a self-service solution. Following a full review of the marketplace, Knight Frank selected Hornbill’s Supportworks ITSM over ten competitive vendor products. Knight Frank invested in Supportworks to support over 1,700 staff based at offices in the UK, Ireland and Germany, with the intention to roll it out to all overseas operations as they migrate onto the firm’s new virtual private network. The introduction of the SelfService interface, based on Hornbill’s Customer SelfService portal, has been particularly successful.Since its launch, calls to the service desk have reduced by 50%. Over 75% of all new incidents and change requests are now logged via the portal and 97% are responded to within a five minute target. For the IT service desk there have been considerable benefits. By tracking all calls logged, analysts are able to identify problems and prioritise accordingly, rather than reacting to the call as it comes in. Calls are assessed against an ‘urgency and impact’ matrix to prioritise them. This has enabled more effective working and increased customer satisfaction. The IT team has been able to start building up a central repository for asset data, to create a Configuration Management Database (CMDB), instead of recording the information on multiple spreadsheets. Knight Frank has been pleased with the adoption of SelfService by users. They intend to continue promoting the service and to roll it out internationally with the objective of having 85% of tickets being raised through the system. Unexpected benefits have been the positive impact SelfService has had on the morale of IT staff who feel less pressurised and are able to be more productive. An additional benefit of the consistency of data collected is that the team is able to produce more accurate and detailed reports. Regular management reports, which used to take the Service Desk Manager two days per month to prepare, are now scheduled to run automatically. Summary reports are also prepared for senior management covering all global IT issues managed by the UK service team. 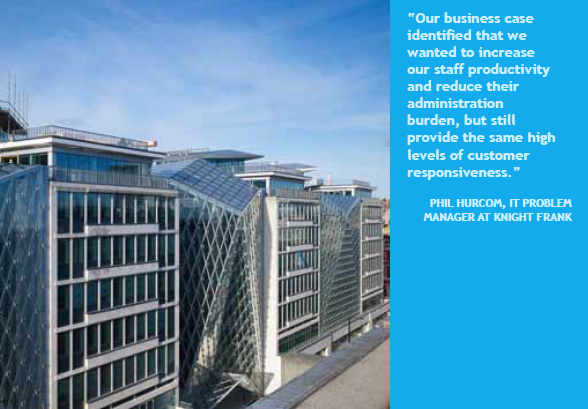 So successful has Supportworks been within the IT service desk that its use has been extended to other departments, for example, the Headquarters Facilities Management team who use the system to manage everything from requests to unblock sinks to issues with power supplies to one of the firm’s two data centres. Additionally Supportworks reporting tools are used by Knight Frank’s Facilities Manager to monitor and review third party supplier performance against their underpinning contractual obligations. The system also provides first line support for the marketing department, for queries relating to the company intranet and content on www.knightfrank. com. Enquiries relating to content, information or access permissions are filtered through the Supportworks service desk, before being passed onto the marketing team to be actioned. Similarly, the company accounts department, responsible for the management of the online expenses system, manages user queries in Supportworks.